3 Foods That Your Dentist Says Can Crack Healthy Teeth! Patients that really want to improve their oral health know that it takes more than brushing and flossing. You must think about the foods and drinks you have, too. Dentists tell you that sugary foods are bad for your teeth, but there are other foods that can cause your teeth to become damaged immediately. Have you ever heard of someone cracking their tooth on a crunchy food? Let’s avoid damaged teeth together with this guide of foods to avoid from your dentist in Virginia Beach. There’s not one person that pops into mind that would actually enjoy having a dental emergency. They’re simply not fun. The good news is that you can reduce your risk of experiencing one by avoiding these foods, especially if you know that you’re a high-risk dental patient. Although nuts are a great snack choice for your health, they can be pretty rough on your teeth. Their crunchy nature can pose a hazard to your smile! If you like nuts as your healthy snack between meals, try to avoid those that are covered with an outer shell. Nuts like pistachios can be hard to open if you don’t have the correct tools. Many use their teeth as a nutcracker which can result in cracked teeth. Thoroughly popped popcorn is great for the teeth. It’s fun and lightweight with a slight crunch—but mostly a melt in your mouth feeling. It only becomes dangerous when patients try to chew on the kernels at the bottom of the bag. Be sure to not accidentally chomp down on a kernel while you’re enjoying your snack. As mentioned in the beginning of this post, we all know sugar is bad for our teeth. The only thing that can make it worse is snacking extremely sticky, crunchy candies. Treats that stick to your teeth are bad, but hard candies can be even worse. Also, the high sugar levels can lead to tooth decay. It’s best to remove them from your diet altogether. If you have a sweet tooth, consider eating more dark chocolate instead. Cracked Teeth Need a Dentists Attention ASAP! When you have a cracked tooth, your smile becomes susceptible to infection below the gum line. Not only is this harmful, but it’s super painful! Your dentist can help restore your cracked tooth before you have to consider getting serious dental work done. When a dental emergency strikes, you need a reliable dental team that’s here for you no matter what. Smile By Design offers care for the whole family from toddlers to seniors. 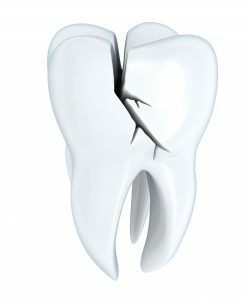 So, if someone had a dental problem like a cracked tooth, you can be sure that your dedicated dental practice is here to help you from restorations to replacements. If you ever have a question or would like to speak to one of our dentists, feel free to give our Virginia Beach office a call! Comments Off on 3 Foods That Your Dentist Says Can Crack Healthy Teeth!